The teacher blew her whistle and the grade RR class were off on their yearly 400m race. This is 5 & 6 year olds with short legs, so they have to take much more steps in order to complete the race. It must almost feel like an 800m or something! I was struggling to get the phones video function to start recording and by the time it was working I couldn’t find Heila. Firstly my eyes focussed on the bundle, then of course the back, but I couldn’t find her. During the week I was explaining to her how its all about competing and taking part and not about winning. Of course all of that talk went out of the window with the dads wheelbarrow race. My eyes glanced towards the leaders and there was my baby way out in front! I couldn’t believe it, it was completely unexpected. It’s not as if the kid has the best athletic genes. Her dad once came third in a 400m on the Graafwater dirt track, but was awarded 1st place because he was the first U/19 to complete the race (the first two was U/17 and U/15). Her mother once completed a 10km race of which she walked 5. On the back leg she was overtaken by a girl that can really run. 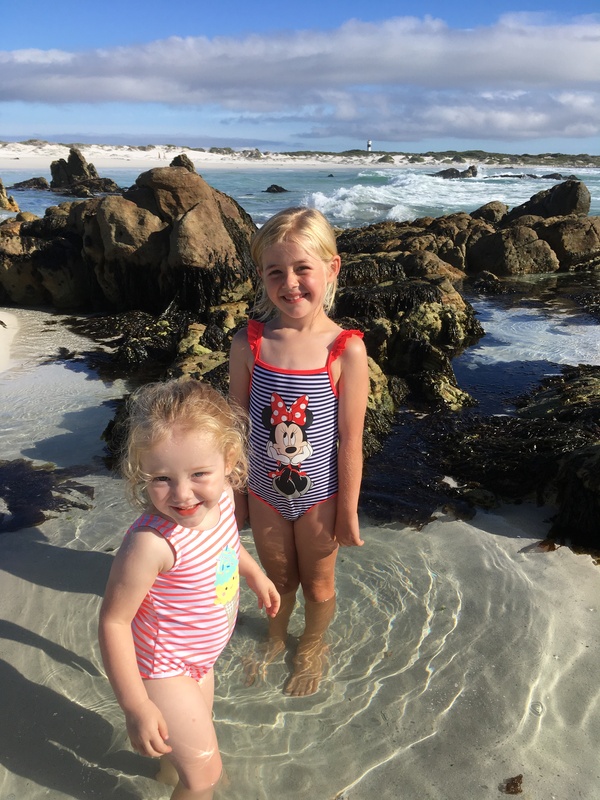 Now she has good genes (as ek die ma so kyk…) and built like a little mini Zola Budd. Heila just kept on running with a steady pace. I don’t know why my emotions got all stirred up. Maybe I was being “girly” or maybe just a proud dad, but the moment she crossed that finish line I realised something. It is not just about winning, but its not just about competing either. Its about giving it your all! She came second with a smile on her face. We were invited to Hangklip by a friend and after all the excitement of the Saturday morning we joined them later that afternoon. And what an afternoon it was, almost windless with nothing but breaking waves and laughter. There was more excitement to come as well. While the kids were putting on their swim suits we started rigging our fishing rods. I scanned over the ocean and could see that the water was quite flat and clean which is never a good sign for fishing. But what can you do? Gallie season was open and we were here to put some food on the table, so to speak. If we could find a spot in between the rocks that had a bit of foaming water we could get lucky. In front of us was a hole with a gully from left to right. It had kelp at the back with scattered rock to the left and a reef to the right. Every now and again the waves would break overt the kelp and roll towards us causing it to stir up some white water. I was hoping that something would be brave enough to venture out of the forest and into the “light” in search of a snack. Rigged with wonder worm on a 1’0 sirkel hook I made a cast towards the kelp. Deon was also rigged with wonder worm, but on a no 2 Daichi! His cast was towards the scattered rocks on the left hand side of the hole. Nothing happened for about an hour when Deon had an enquiry. Just a tap-tap and then nothing. He reeled in and one could see some bite marks on his worm. Being lazy and without rebaiting he decided to throw it again just like that. Next thing his rod jerks forward and line starts peeling of his reel. The fish swam to our right and for a brief moment got stuck behind the rocks about 10 meters in front of us. 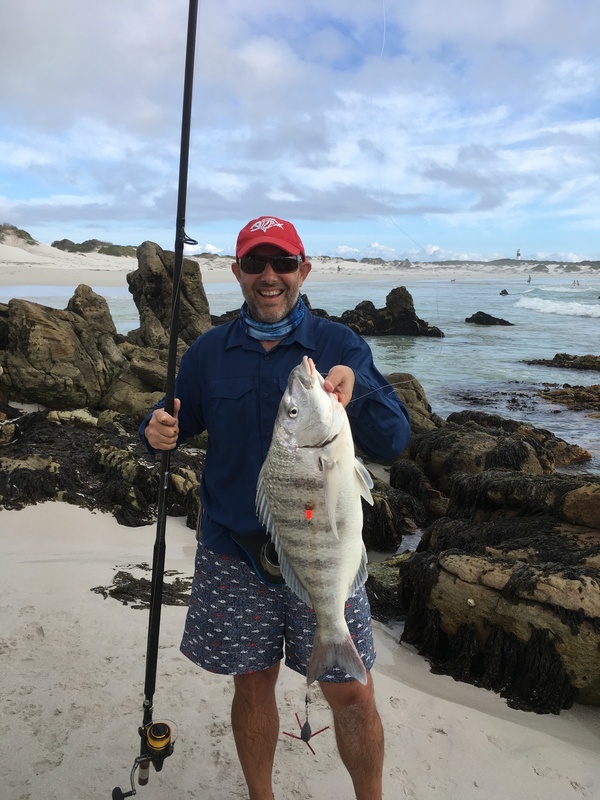 Deon was sure it was a Spotted Gully Shark by the weight on his rod and therefor didn’t care much (Spottys love wonder worm). He put more pressure on the fish than usual and pulled it hard through the rocks. Luckily the fish got unstuck and the next moment a flash of silwer was at our feet. 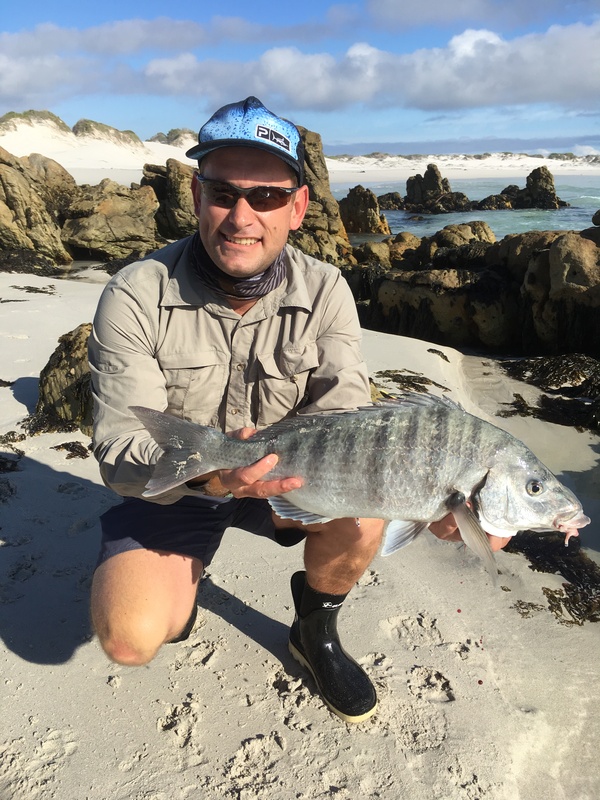 Out of nowhere he landed a stunning Steenbras of 62cm. We couldn’t believe it. We rebaited and made another cast, both now towards the left where Deon got his Steenie. When nothing happened after a few minutes I reeled in and continued fishing right in front of me as close to the kelp as I could get. All of a sudden my line went slack. I thought this was strange since there was no waves running towards us. I was about to start reeling when the slack was picked up in a flash and my rod jerked forward with line screaming off my reel. There was no doubt in my mind, Steenbras! The fish swam hard right and I had to quickly hop and skip over the rocks to my left to create an favourable angle so he couldn’t cut me off. He paused for a second, shook his head and was off again with some vigour, wow. I have had a few tussles with these wonderful fighters in the past but never between rocks. It was nerve wrecking and exhilarating all at once! I gained some line on the fish and forced him back into the hole. He then decided to come left which played into my hands. By now I had a bit of a crowd behind me made up of my wife and kids, Deon and his girlfriend. With the kids cheering me on I was in full concentration to not loose the fish. It was quite the balancing act with my two feet on a tiny little rock point and in my hand something that’s trying to pull me over. “Don’t loose the fish” was quickly followed by “don’t fall in” when I lost my balance for a second. Usually I would walk backwards slowly to land a fish and then let the rolling waves do the rest. But there was no such luck on this tiny mountain. I reeled in with the waters surge and the fish came close. Not enough so that I could land him though and with the water subsiding so did the fish. Luckily my drag was soft and with the rod tip it allowed for enough give so the hook couldnt pull. By the third or fourth attempt I finally managed to work him into a small gutter in front of me and was able to quickly grab him by the gill plate before the next wave came running in. A beauty of 67cm was hanging on my finger, not a giant by any means but still a nice fish. We were all exited, even the wife uttered a jo jo jo! Thinking about it now, maybe that’s why I got so emotional. I saw in Heila’s run some “Steenbras” character. Not giving up, fighting to the end and giving it everything! Both fish were tagged and released. Geluk met jou mooi kind se prestasie! Pragtige visse en dogtertjies! This is how we fish!